I recently joined my friend Stephanie and her blog The Enchanting Rose for a teacup exchange that she hosted. This was the first time that I have joined a teacup exchange and it was so much fun. I enjoyed picking out the goodies that I was going to send to the person that I was assigned to by Stephanie. Here is what I received from the person assigned to me! My gifts arrived in the mail from Kati at Kati's Little Corner of the World. 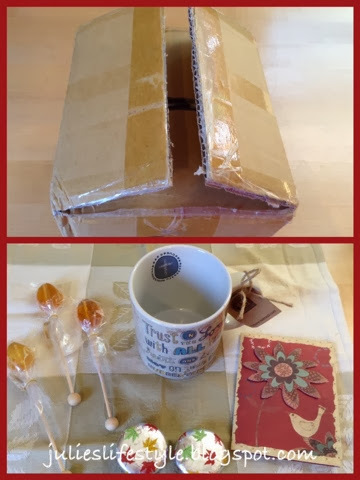 It included a tea mug with a Bible verse on the mug, two chocolate covered cookies and 3 lollipops for tea and a pretty card. To see the rest of the teacup exchange, please visit Stephanie at The Enchanting Rose. 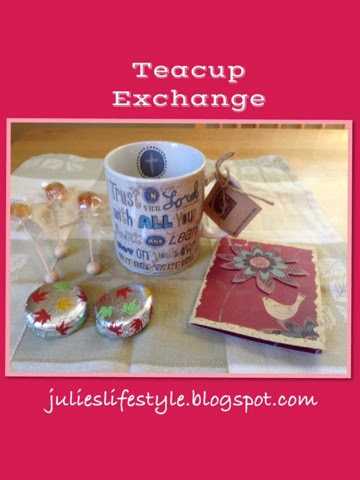 Thank you Stephanie for hosting this fun teacup exchange and to Kati my new blog friend, for all my special gifts. Thanks to my new blog friend Vicki from Life on Willie Mae Lane who I was assigned to send my package to. This was such a fun way to meet new friends! Wishing you all a lovely fall weekend and see you next week! I am very glad you joined the exchange, Julie :) May you, dear friend, have a delightful weekend. Hugs to you! Kati is a sweetheart and what a wonderful gathering of gifts she had for you. That's a wonderful mug and a terrific reminder of God's faithfulness in each new day! A nice mug for drinking hot chocolate or sipping tea out of! I love the color and design. I love any kind of cups with scripture on them. It's nice to be able to read them over and over again while enjoying a hot cup of tea or coffee! What a special mug. You got a wonderful package. Oh how fun! I love to do stuff like that. Great way to be a blessing to someone else. Have a great weekend Julie! What a great mug and other goodies too! I love these exchanges, not just for the treats, but to read new blogs and meet new people. So fun. Glad you enjoyed your mug and treats! It's been fun getting to know you! Nice to meet you through Stephanie's teacup exchange! Your gifts are just lovely! This was such a fun experience! Looking forward to next time! Isn't it exciting when a parcel arrives in the mail carrying all kinds of lovely things! You are lucky, those are some beautiful treasures. Love the mug. So nice to find you through our sweet friend Stephanie. I'm a New Yorker, too, and spent the day with friends in Brooklyn. Our mugs went around the country -- my package was from Vicky -- and here are two New York bloggers.